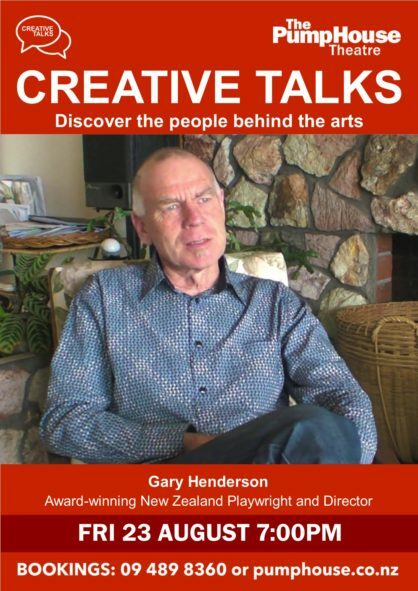 Gary Henderson is a New Zealand playwright, director and teacher whose work is produced locally and internationally. He is an experienced teacher of theatre writing, and after working in Performing and Screen Arts at Unitec for six years, he established his own writing course at Corban Estate Arts Centre in West Auckland in 2012. Gary also facilitates The Learn Writing for Theatre Workshop hosted here at The PumpHouse since 2016 which is aimed at giving budding playwrights the chance to develop their craft and have their work performed. In November 2013 Gary received the Playmarket Award acknowledging his signiﬁcant artistic contribution to New Zealand theatre. As well as his own scripts Gary has also collaborated on libretto for an opera Star Navigator with Tim Finn. Gary will talk about his writing process and how that is linked with working as a director.